Chef/Owner Angelo is a member of the Chaines de Rotisseurs, a gastronomic guild that dates back centuries. He is personally responsible for introducing his genuine Italian cuisine, taking your orders and sometimes pouring your wine. Angelo Faro (born in Rome in 1942) studied as professional chef in Cento (near the Italian town Ferrara). 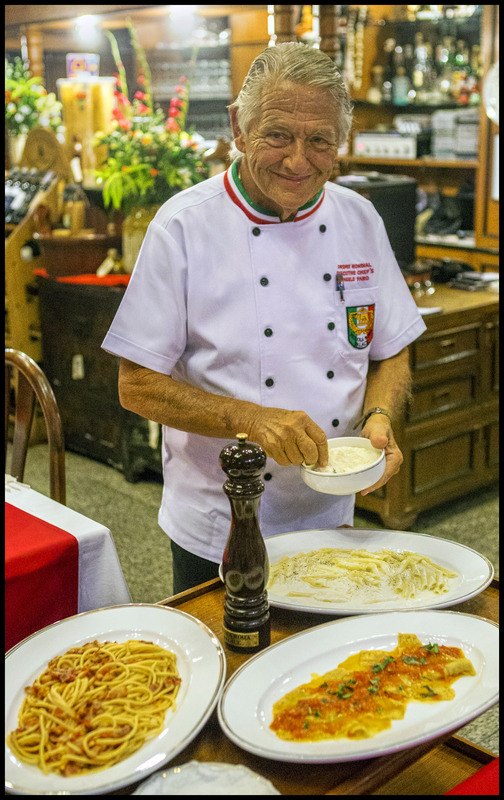 He opened his first restaurant in Rome when he was 22 years old, working fruitfully for about 10 years. In the 80s he shifted his restaurant to Amsterdam till 1989. Then, he settled with his Thai wife in Chiang Mai (Thailand), founding, in 1991, Piccola Roma Palace, considered, even today, one of the best Italian restaurants in Thailand. Angelo and his well-trained staff are charming and engaging with genuine good old school service. His fresh homemade pastas are excellent in taste, texture and are made with the best ingredients with Salad and vegetables from the King’s Royal Project Farms. Celebrities who have paid a visit there over the years: Liz Taylor, Angelina Jolie, Dolph Lundgreen, Denis Leary, Danny Glover, Ray Liotta, Thailand Royal Family, Bhutan Royal Family. Bucatini w/bacon, onion, tomato, chili, olive oil & pecorino cheese. Ravioli w/fresh ricotta cheese , spinach & tomato. Penne con tartufo nero(estivo) italiano alla crema specialita.